Abidjan, 11 May 2000 — In a press conference today in Abidjan, West Africa, the international medical organisation Médecins Sans Frontières (MSF) called on 15 French speaking countries of Africa* to not sign revised regional trade agreement (Bangui 99). A joint report released by World Health Organisation (WHO), UNAIDS and Médecins Sans Frontières* warns of the negative consequences of such an agreement on access to essential medicines. The revised arrangement relating to Intellectual Property (Bangui 99) reinforces the monopoly given to patent-holders beyond existing requirements in international trade rules and would cause a major obstacle to access to medicines. They also discourage the transfer of technology necessary for the development of the regional pharmaceutical industry and threaten to increase dependence on imports of medicines. ‘Doctors in Africa are increasingly faced with a lack of life-saving medicines - either because they are too expensive, or because they do not exist. The revised Bangui Agreement means ffrqncophone countries in Africa will no longer be able to shop around for the cheapest medicines, nor will they be able to produce drugs locally.’, said Dr Bernard Pecoul, director of MSF’s Access to Medicines Campaign. During the process of revising Bangui; extensive technical assistance was provided by international organisations. The advice did not lead to the inclusion the flexible use of safe-guard features recommended by US President Clinton, French President Chirac and WHO Director General Dr Brundtlund like parallel imports and compulsory licensing. MSF demands that the technical assistance that is offered to countries to change their laws takes into consideration the public health needs of developing countries and the adviced of world leaders. ‘The new rules mean the price of medicines will be 10 to 20 times more than they would be if they were generic. For people suffering from Aids or from other serious infections such as meningitis or pneumonia, this is basically a death sentence’, added Dr Pecoul. Revise the agreement before signing. Allow those ten ‘least developed’ countries which, under WTO rules, qualify for another 5 years ‘transition period’ (until 2006) should not revise their laws until then. In addition MSF recommends that the expertise of the WHO be sought in the revision of the agreement to ensure that the interests of public health are preserved. 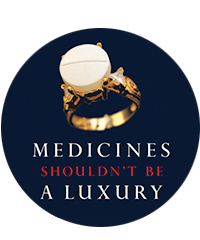 If the protection of pharmaceutical innovation is essential to public health,then so is the affordability of medicines. *Cameroun, Congo Brazzaville, Côte d’Ivoire, Gabon, Sénégal, Bénin, Burkina Faso, République Centrafricaine, Guinée, Guinée Bissau, Mali, Mauritanie, Niger, Tchad et Togo. *Joint Mission MSF-WHO-UNAIDS Revue of the Pharmaceutical Policy in Cameroon - Medicine patents in Francophone Africa by Pascale Boulet, MSF and Gilles Bernard Forte - (Report available in English and French).